Bitcoin drops below $4,000, will this be another 'Bloody Monday'? Following a relatively quiet weekend, with Bitcoin trading in its long-established range between $4,000 and $4,100, Bitcoin has now fallen below the $4,000 price mark. Will BTC be able to bounce back, or will this be a another 'Bloody Monday'? Bitcoin is experiencing a -1.80% decline in price, currently trading at $3,947.09, after a solid 10 days of holding above the $4,000 price mark. 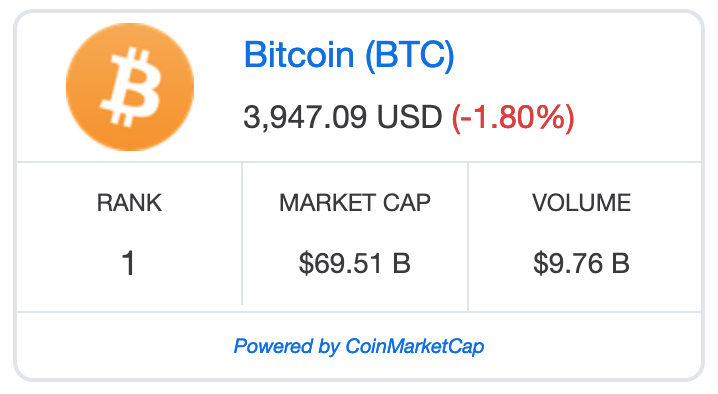 The total market cap is as well taking a hit with more than $2 billion being wiped from the market, at the time of writing, according to coinmarketcap.com. The entire Top 20 cryptocurrencies are showing red candles sticks, with the exception of Tezos, which is showing a 2.78% gain and is currently sitting at number 20 with a market cap of $453,664,446. Just yesterday, Chepicap reported that most analysts are looking at the upper bound of BTC’s yesterday's trading range, the $4,200 price mark, as a level of serious resistance. However, one cryptocurrency analyst, who goes by the Twitter handle, Crypto Krillin, pointed out that the moment of truth for Bitcoin is near. According to the crypto trader, or BTC will fly straight towards the $5,500 price mark, or we will re-visit $3,000. Today's decline in price, might be the indicator that we will re-visit $3,000 rather then fly to the $5,500 mark. Another widely recognized cryptocurrency trader known to the Twitter community as 'The Crypto Dog', as well said that it is still possible for Bitcoin to drop to $3,500 in the short term, adding that the market conditions haven't changed over the last several days. Hopefully both traders are incorrect about BTC's possible price drop. Where ever the market is headed, Chepicap will be there to guide you through it.